This page is a combination of the three “People I’ve Met” pages, and the written descriptions, from the original MikeChimeri.com. The pictures were taken between 1999 and 2007. I’ve kept most of the original text intact, but have made updates here and there. All 35mm pictures have been replaced with higher-quality scans. 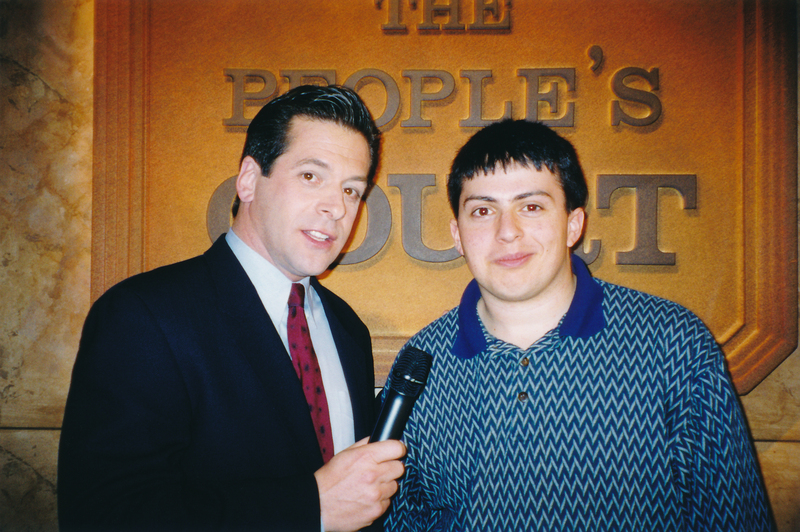 On April 27, 1999, I was in the audience for The People’s Court as part of a field trip for my 12th Grade Business Law class. My Business Law teacher took this picture of a bubbly me with Curt Chaplin, the court reporter. Curt also does voiceover and narration. He has narrated a number of World Series videos for MLB Productions. 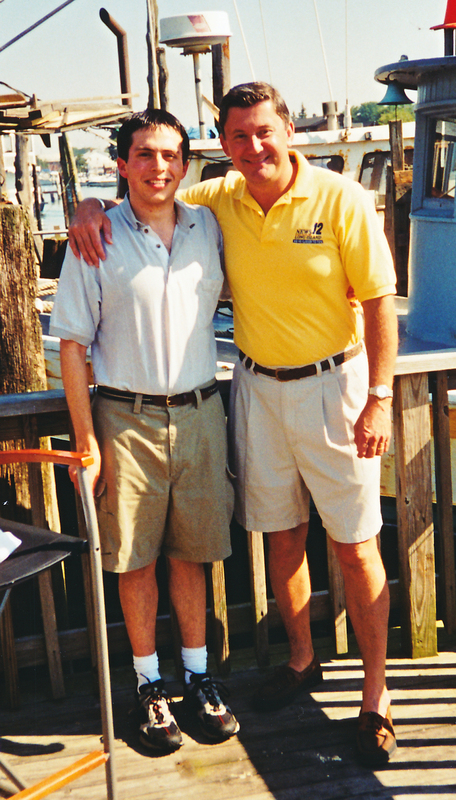 On July 21, 2000, News 12 did a remote for their Morning Edition newscast from my family’s then restaurant on Freeport’s Nautical Mile, Ehrhart’s Clam House. 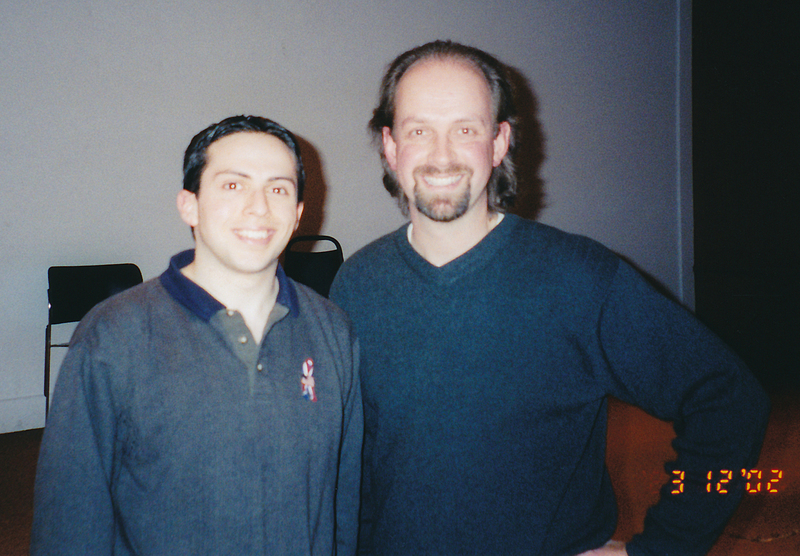 I am pictured with the co-anchor at the time Doug Geed. Ehrhart’s Clam House was sold in April 2004. On December 1, 2000, I took a trip to the MoMA (Museum of Modern Art). While in Manhattan, my father and I stopped by the Ed Sullivan Theater, home to The Late Show with David Letterman. Since it was a Friday, there was no line. The Friday show is always taped earlier in the week. After stopping in the CBS Store, we went to the Hello Deli. 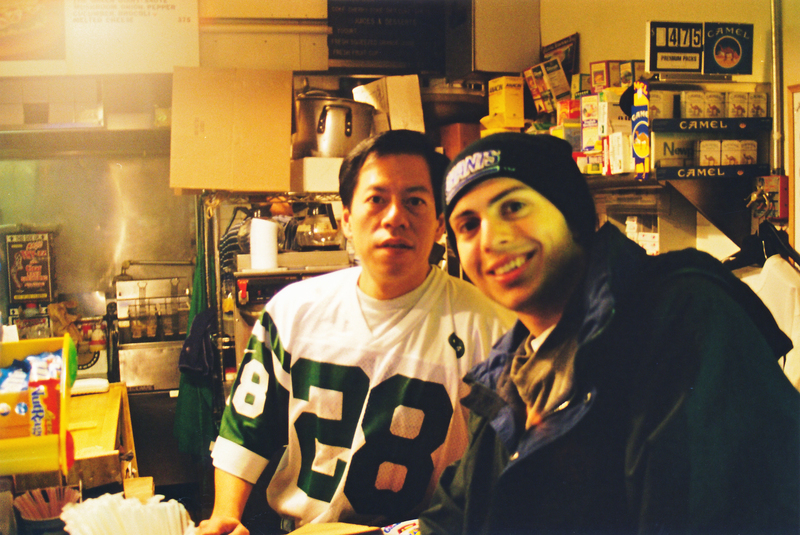 There, while getting a bottle of water, I met the owner, Rupert Jee, and asked if I could take a picture. He said we could and my father did so. On March 12, 2002 (the date’s on the picture), Roger Luce, a C.W. 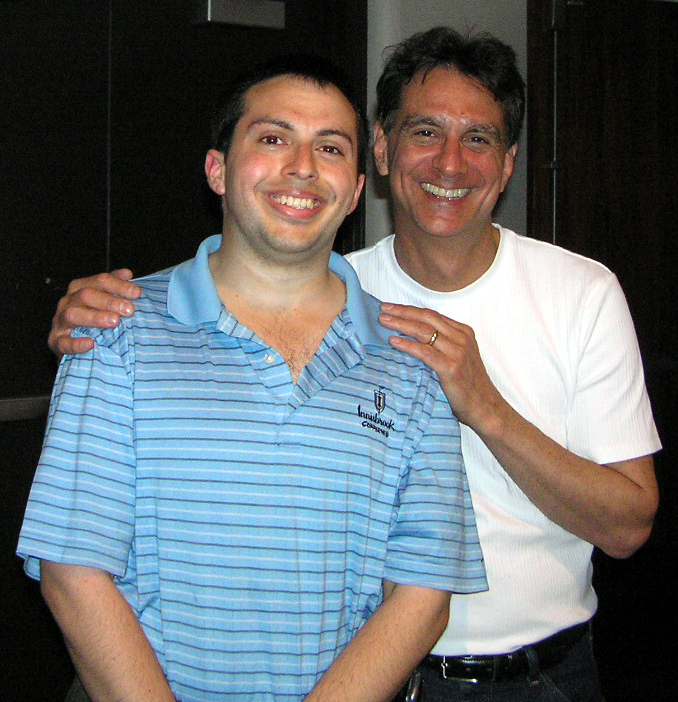 Post an LIU Post alumnus and co-host of Roger & J.P. on WBAB-FM, came to speak to Broadcasting majors at Post. Here I am with him. On April 2, 2003, two C.W. 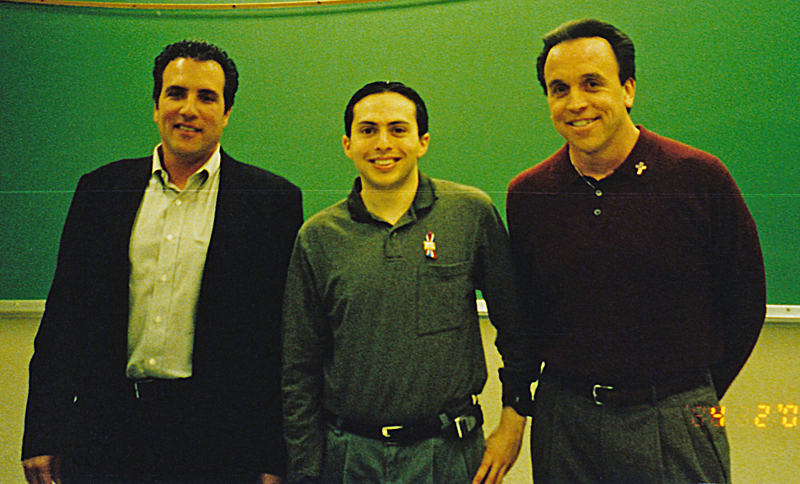 Post alumni came to speak to Broadcasting students: Fred Gaudelli (left) and Dan Reagan (“REE-gan”) (right), both of the Class of 1981. Gaudelli was the producer for Monday Night Football on ABC, and also produced ABC’s telecast of Super Bowl XL. He is now the producer for Sunday Night Football on NBC and has produced NBC’s Super Bowl telecasts. Reagan once directed Atlanta Braves baseball games for Turner Sports, and now directs for ESPN. After they spoke, I got my picture taken with them. It was great to meet them. 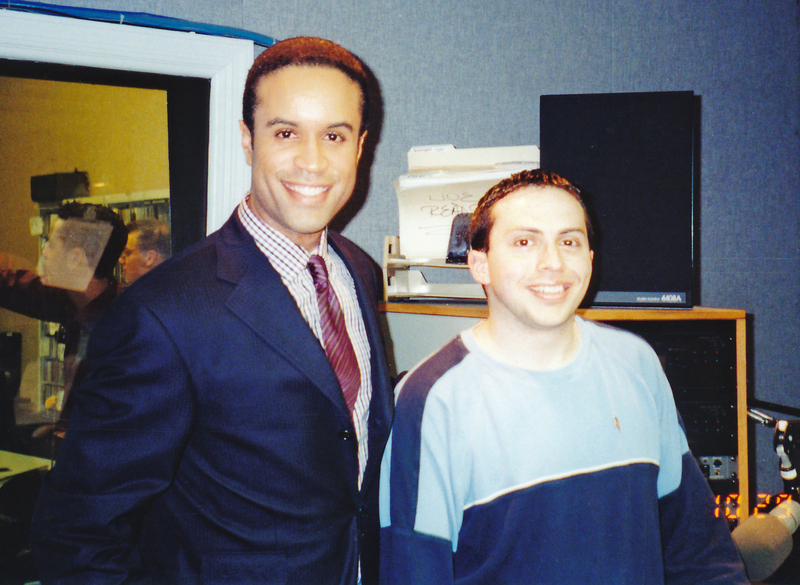 On October 29, 2003 (again, date on the picture), Maurice DuBois (then of WNBC-TV, NBC 4), came to speak – like Roger Luce – to Broadcasting students at C.W. Post LIU Post. While he did this, I was on the air with my show. During songs, I would open the door to listen in and take a few candid pictures. Here I am with him after he was finished. Maurice is now the co-anchor of CBS 2 News at 5 and 11PM on WCBS-TV. 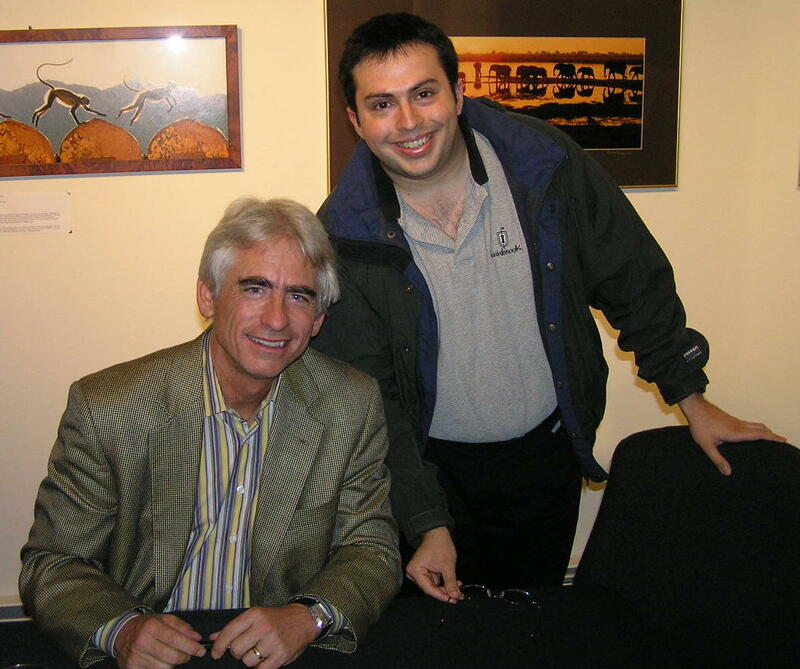 On July 12, 2003, at Planting Fields Arboretum in Oyster Bay, New York, I first met David Benoit, but the picture my father took was out of focus. 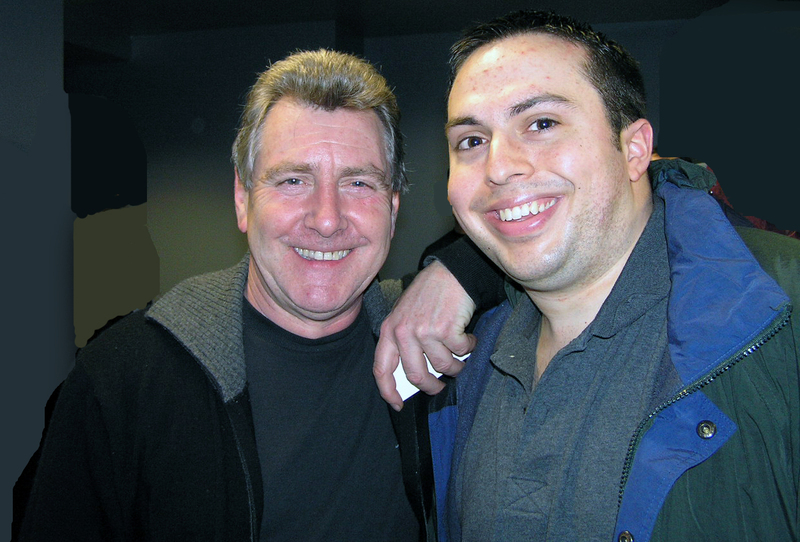 Still, it was a thrill to hear him live and to meet him afterwards. 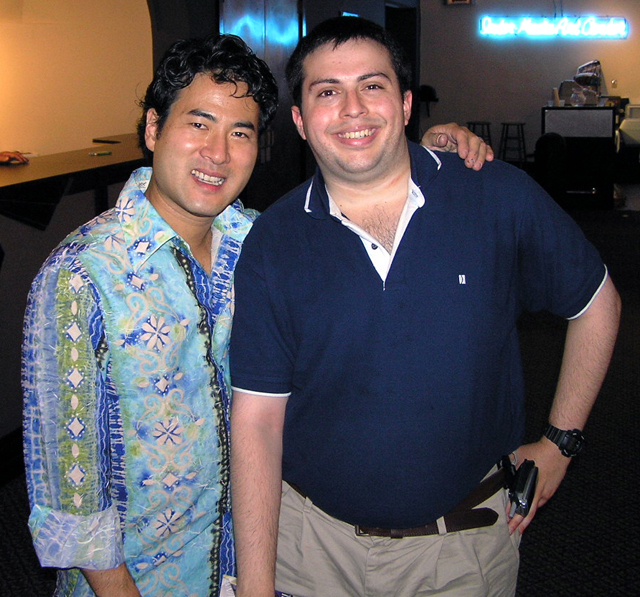 Nine months later on April 24, 2004, I met him again at the Tilles Center at C.W. Post LIU Post (as the building was in the middle of renovation). The above picture was taken after the concert. This was a concert where I learned the hard way (after a woman chided me for clapping to David’s solo rendition of “Linus and Lucy” during his encore) only to clap when prompted. David and I arranged – through his management at the time – a phone interview to record after his return to California. The interview was recorded on April 28, 2004. ince then, three more interviews were recorded. In each one, my interview style improved. 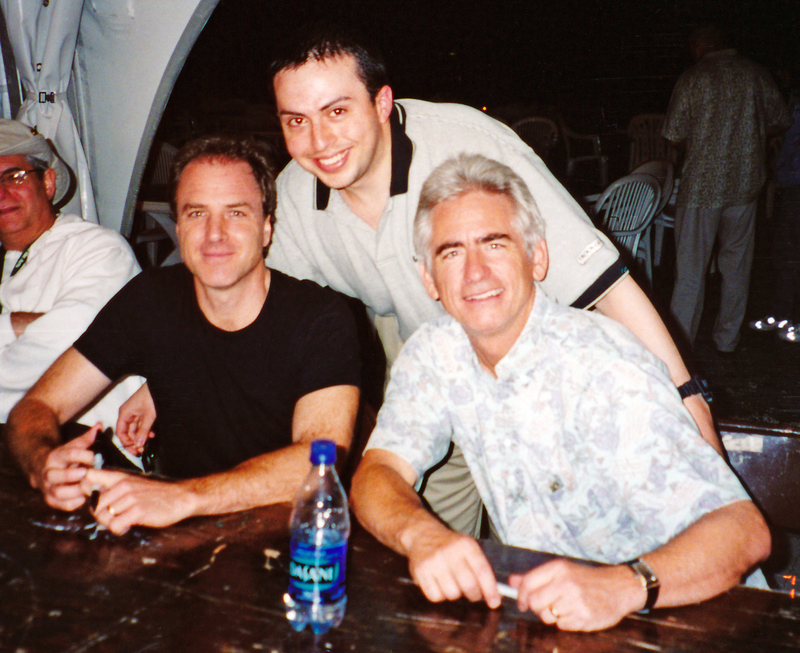 On July 24, 2004, I met David Benoit (right) yet again, this time, after his concert with Russ Freeman (left) of the Rippingtons at the Planting Fields Arboretum. This was a concert to promote their collaborative album, The Benoit/Freeman Project 2. I introduced myself as “Mike Chimeri of WGBB.” David remembered who I was. Unfortunately, I didn’t have much time to chat because the line was moving fast. I made up for it in an online chat session for his fans a couple months later on his website. 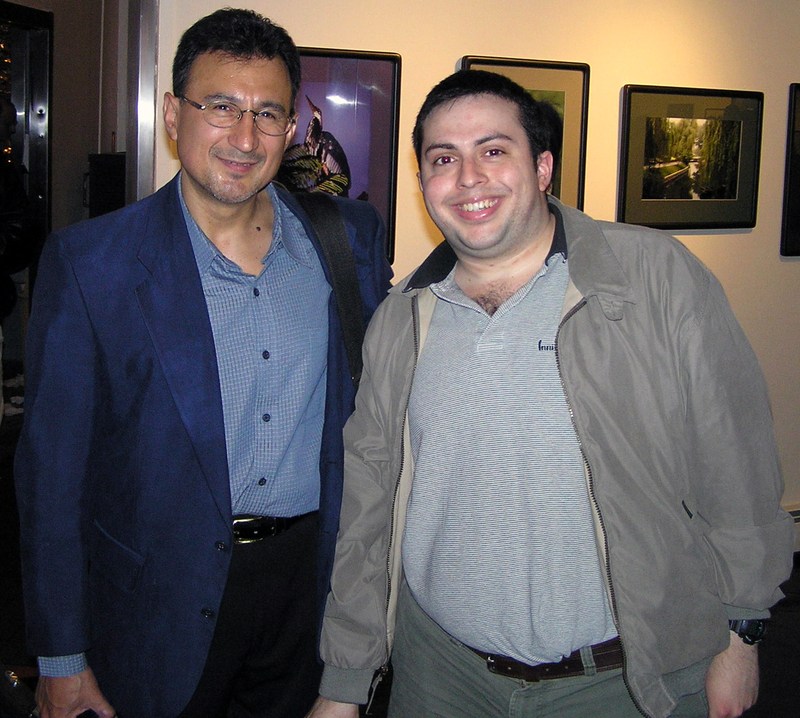 I recorded an interview with Russ on July 5, 2005 and another one on September 29, 2006. 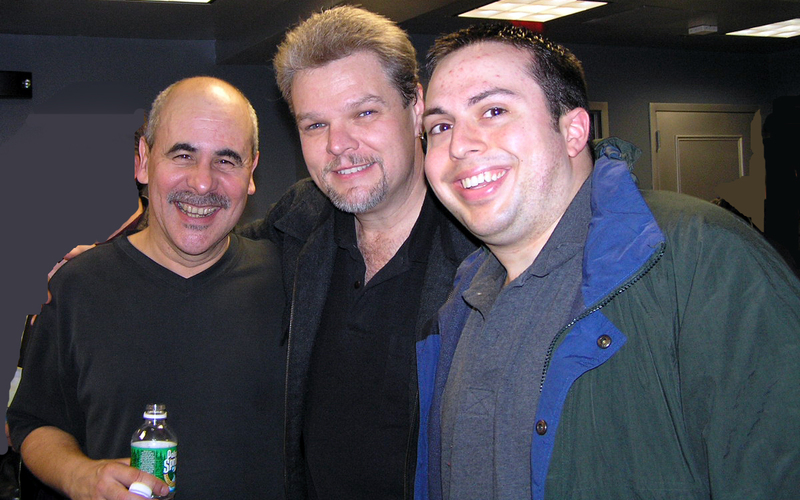 …and Scott Ambush of Spyro Gyra. This came after their performance at the Boulton Center in Bay Shore, New York. As I met them, I told them I worked for WGBB and gave out cards for The Instrumental Invasion. Not even I knew that two weeks later, I’d make the decision to end it on May 5. 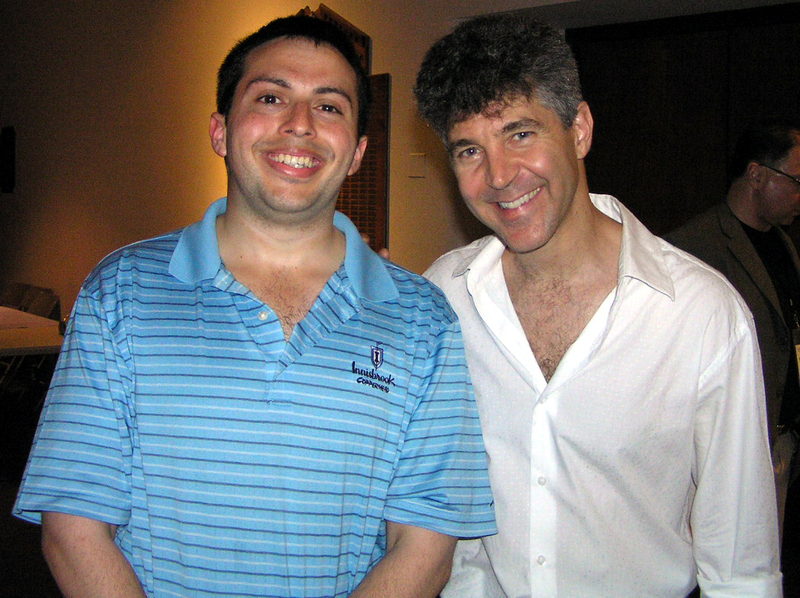 Three months after their performance, I recorded an interview with Jay Beckenstein. A second one followed in February 2006. I also recorded an interview with Tom Schuman in November 2005 as his solo album Deep Chill was weeks away from being released. 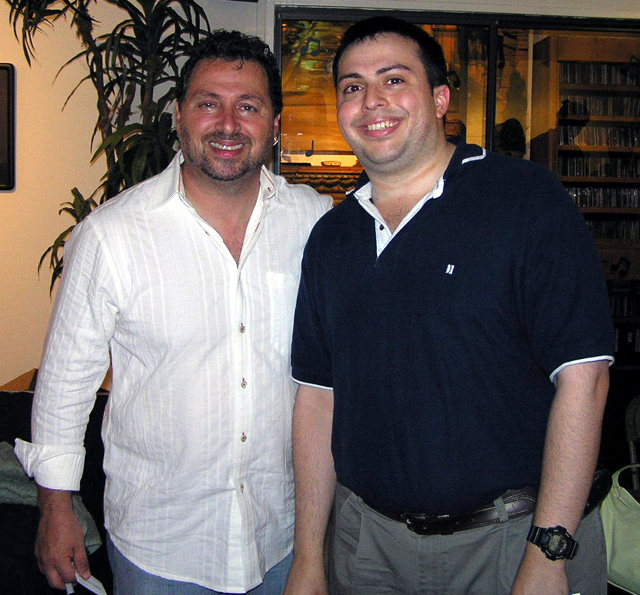 On July 13, 2005, I went to see Chieli Minucci of Special EFX perform with John Favicchia’s band, the Dharma All Stars, at the now defunct Backstreet Blues in Rockville Centre, New York. This was the first Dharma show I had been to and I’ve been to most others since. 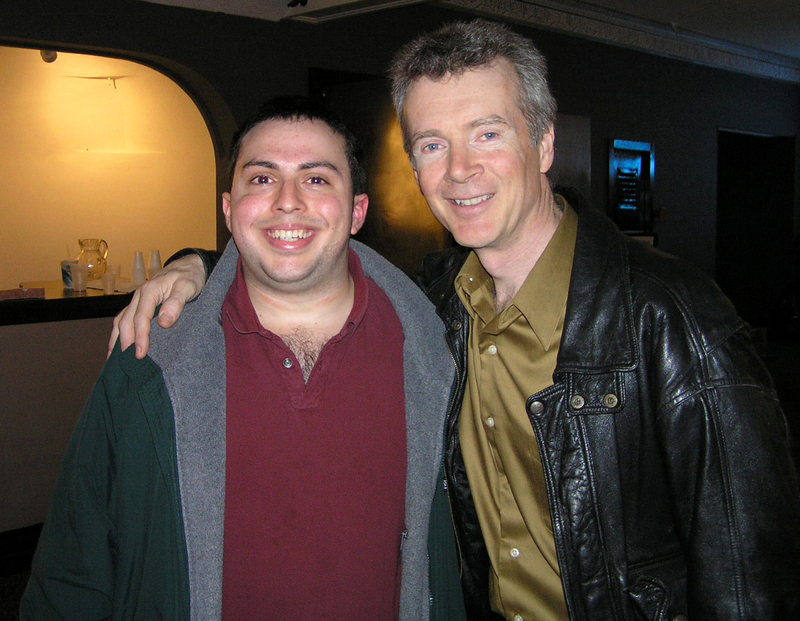 On May 5, 2006, I saw Chieli perform with his band Special EFX at IMAC (Inter-Media Art Center) in Huntington, New York. 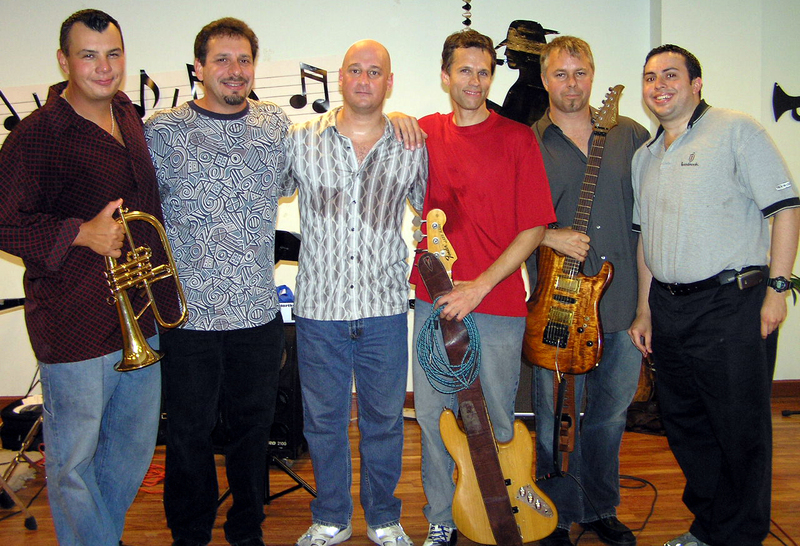 On September 10, 2005, the Dharma All Stars performed at the Long Beach Public Library in Long Beach, New York. From left to right, I am pictured with Carl Fischer on trumpet, Bill Heller of the keyboard, John Favicchia on drums, Jack Knight on bass, and Chieli Minucci on guitar. remembered. I told him I played a track from his recently released album Orchestral Stories, “LAXperience,” the week before. He was delighted. …and Peter White. 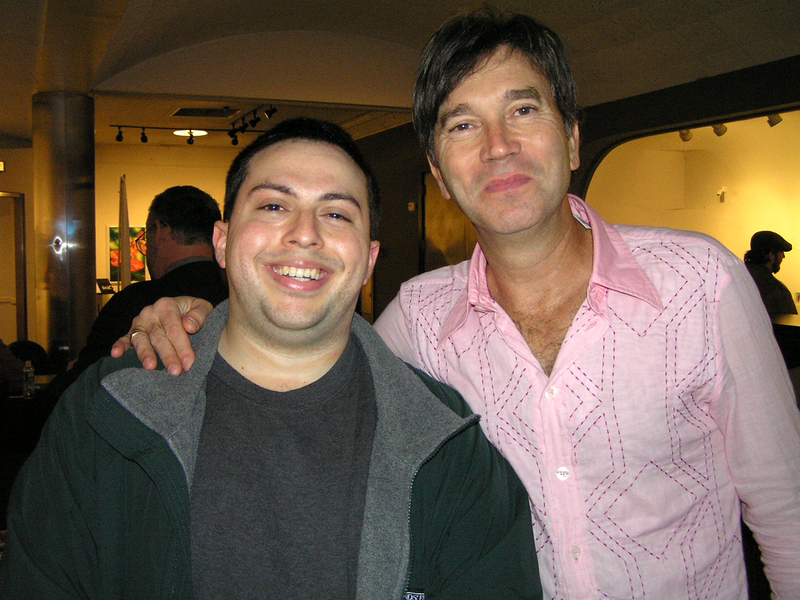 It was too late to meet Rick Braun as he got back on the tour bus before the end of the meet and greet session, which is when these pictures were taken. It was nice to finally meet two people that I only knew through e-mail and phone contact beforehand. Mindi was so happy to finally meet me in person, she had to give me a hug. In my interview with her that aired April 12, 2006, I thanked her for it. Mindi’s third album, Life Less Ordinary, was released on April 18. Peter’s album, Playin’ Favorites, was released on June 27. I saw Peter again on July 28, after his performance with Guitars and Saxes. On August 9, I recorded my second interview with him. The interview aired September 6. On December 14, 2005, a bitterly cold day, I asked then WCWP Program Director, Pete Bellotti, to take a picture of me with the well-bundled-up Jason Cascone and Darlene [London] Johnson of So, You Wanna Job… I’m not wearing a coat or gloves because I was going to stick around the station for another hour and a half. They were headed back to the PEP Office. Also of note, I filled in for Joe Manfredi, who was the engineer at the time, for the first two minutes of their show. Joe reclaimed the reins after that. On March 1, 2006, after seeing the Dharma All Stars’ monthly performance at D.J. 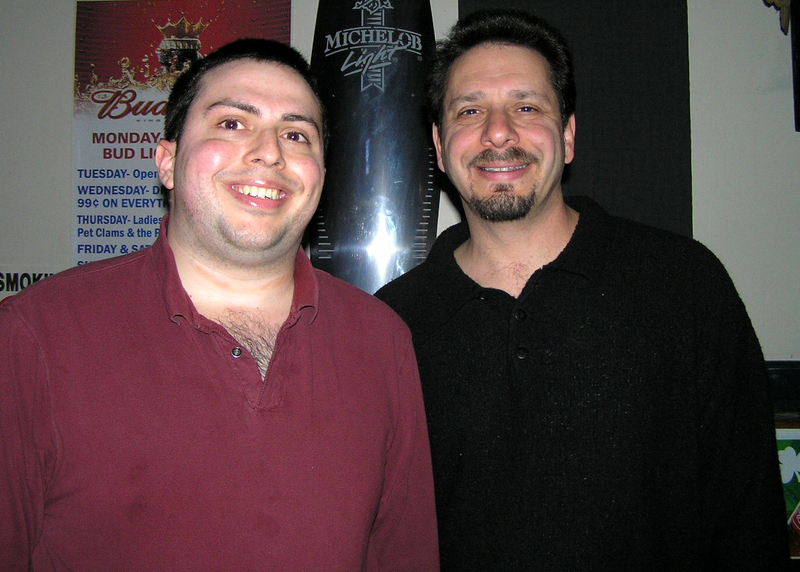 Rider’s (then the Funky Munky Lounge in Oceanside, New York, I had my picture taken with keyboardist Bill Heller. 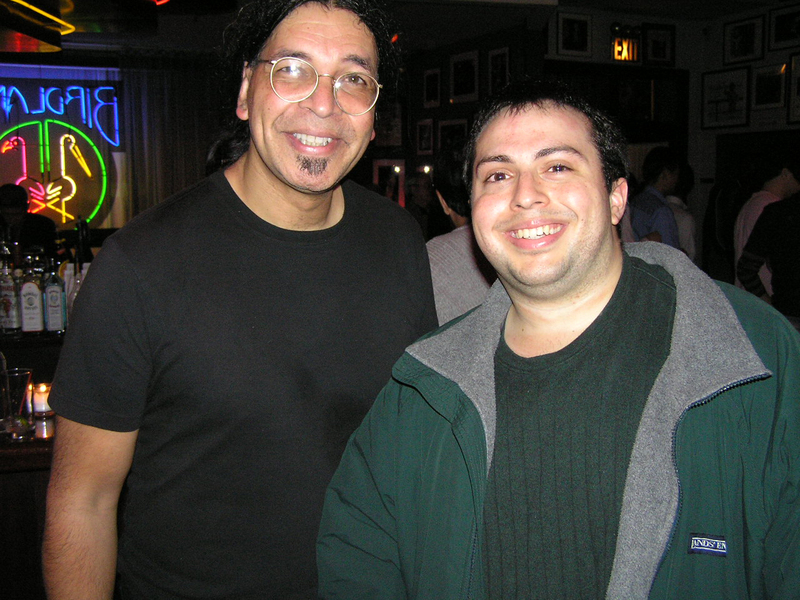 Bill is also the keyboardist for the Rippingtons, and has produced and performed on guitarist Steve Briody’s two albums, Steve Briody and Keep On Talkin’. 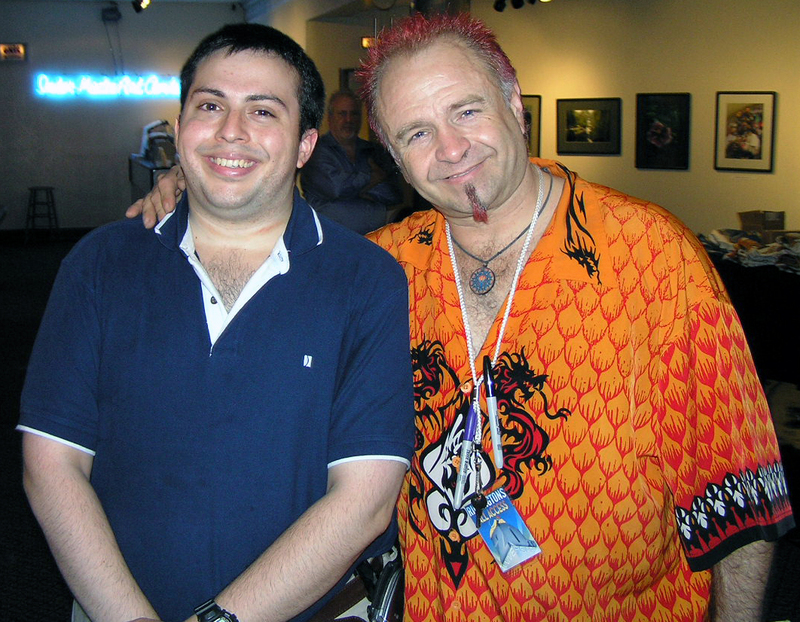 On April 29, 2006, at IMAC, the Dharma All Stars and the Matt Marshak Band played one after the other. However, they are tied together by the fact that most of them know each other. In particular, saxophonist Mario Cruz has a band called Natural Selection (“Original Music for an Evolved Species”). Bill Heller of Dharma All Stars is in that band. I am pictured here with Mario Cruz. 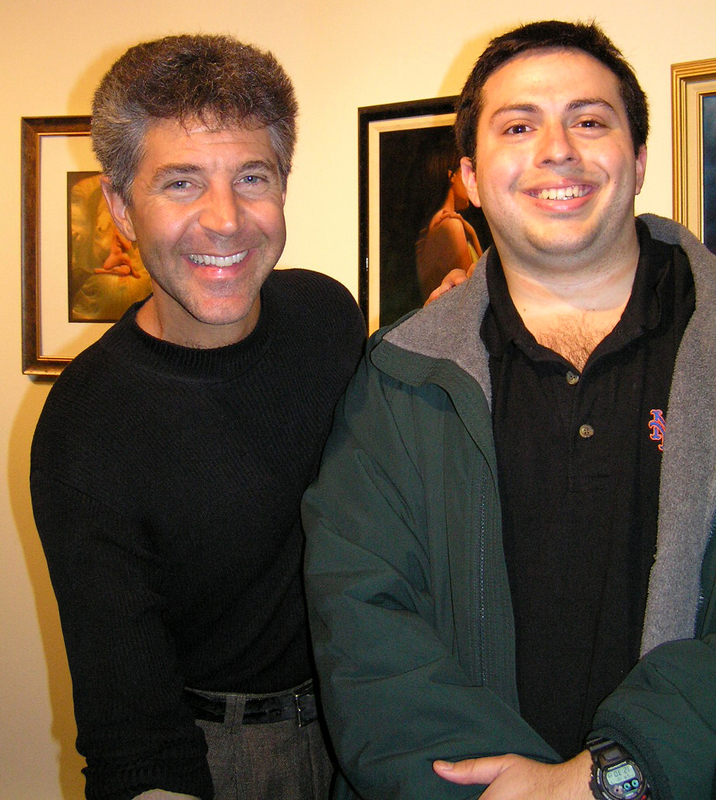 On May 5, 2006, following a performance by Special EFX at IMAC, I got to meet keyboardist Jay Rowe. Along with Special EFX, Jay has performed with artists like Ken Navarro, Marion Meadows, and Nelson Rangell. He has albums of his own, the latest at the time being Red, Hot & Smooth. I recorded an interview with Jay on August 7, 2006, which aired August 16. On October 6, Jay returned to IMAC as part of Nelson Rangell’s band, and was there again on November 17 with Marion Meadows. In the months since our interview, Jay and I became great friends. 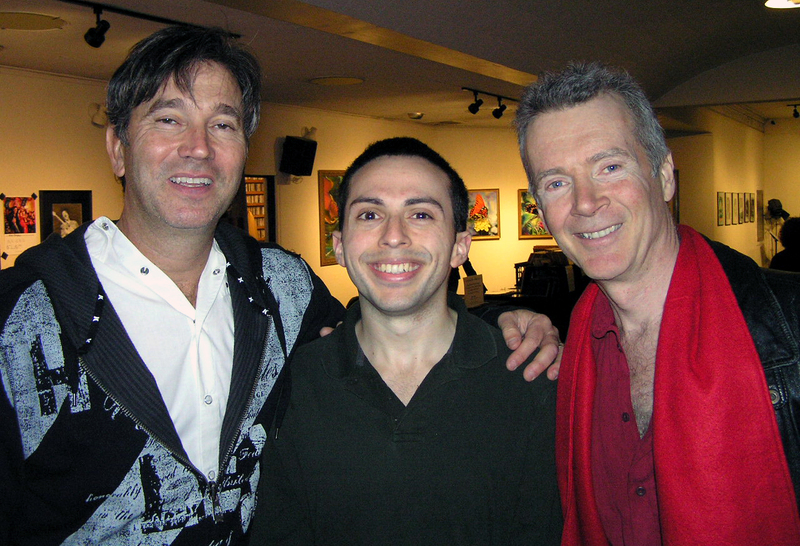 On May 31, 2006, I went to Il Piatto in Oyster Bay, New York, to see Mario Cruz’s band Natural Selection (“Original Music for an Evolved Species”). In between sets, Mario and his bandmates stood (and I crouched down) for a group picture. From left to right, Bill Heller on the keyboard, Mario Cruz himself on the tenor and soprano saxophones, Lee Finkelstein on drums, Jack Knight on bass, and Steve Briody (BRY-dee) on guitar. 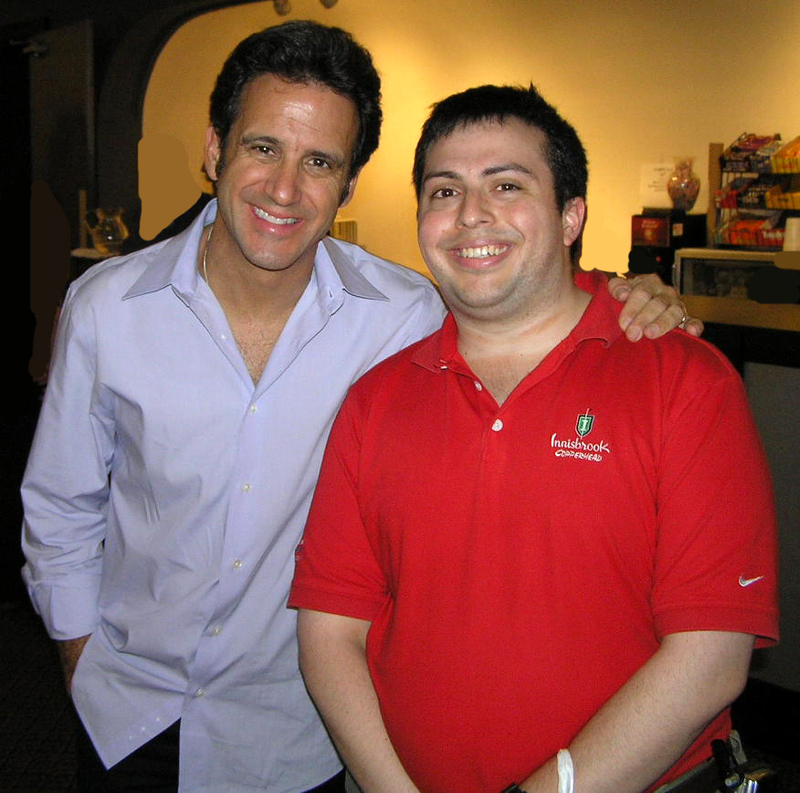 …Eric Marienthal. 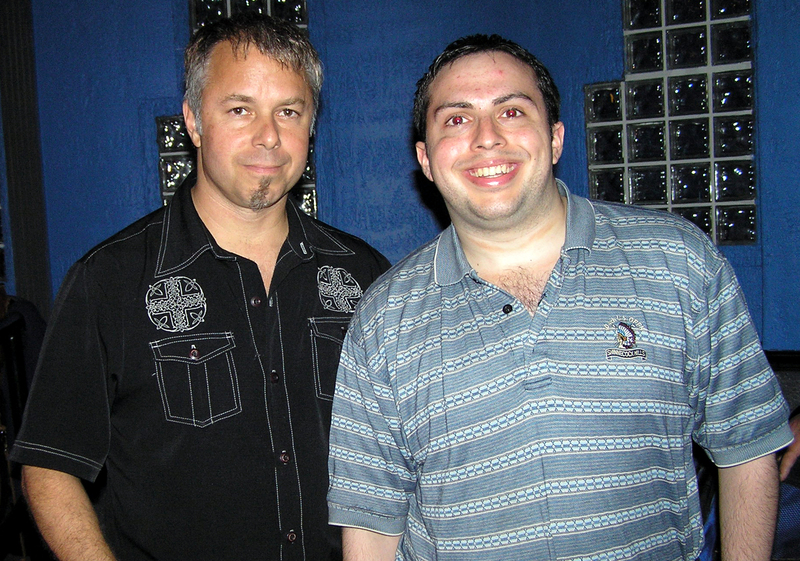 After I spoke with Eric, I told him to say hello to his Rippingtons bandmate, and my fellow acquaintance, Bill Heller. He told me that Bill had been backstage during the show. So, Eric took me back inside the theater to say hi to Bill. It was quite a night at IMAC. the picture. Thanks to Gerald, Richard, Peter, Jeff, and all others involved. For those of you keeping score, that’s three saxophonists in a row that I’m pictured with. 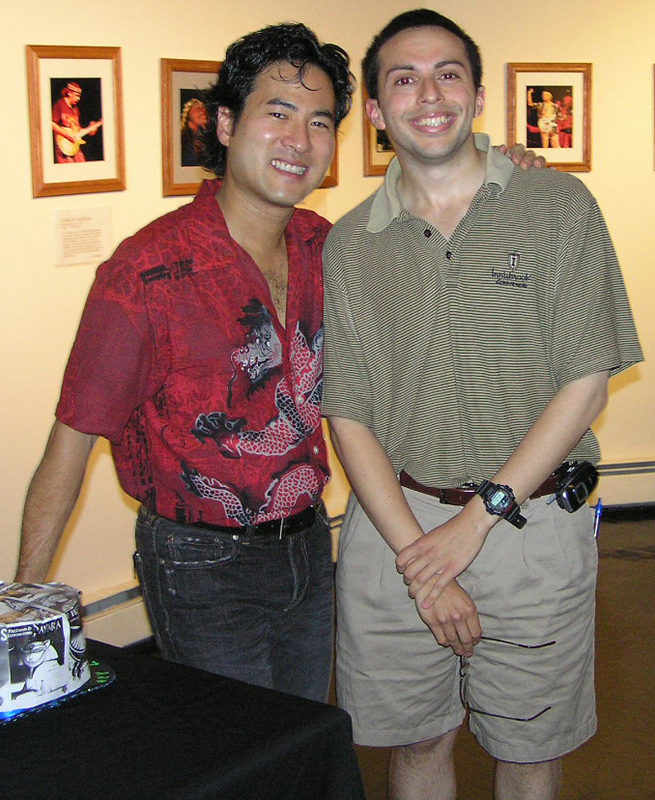 …Jeff Kashiwa, seen above. At the end of the show, the first song of the encore was “Tourist in Paradise.” During the song, Jeff came up into the audience and, of all places, walked up to the row I was sitting in and played within a few inches of my seat. Not only that, he was facing my direction. I did not bring that up when I saw him after the show. Instead, I told him who I was, that I had interviewed him before, and that I spoke to Dan Siegel (a good friend of his) the week before. 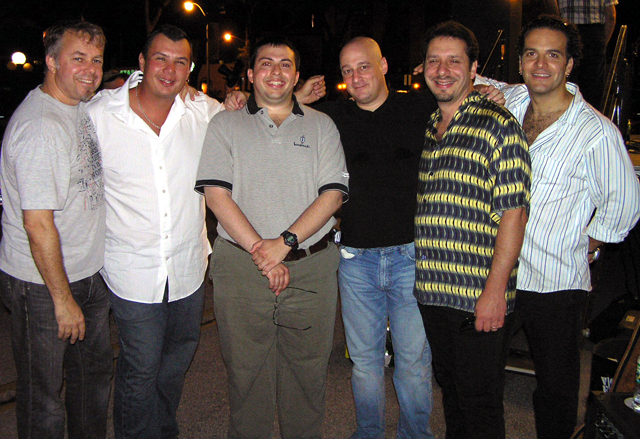 On September 7, 2006, the Dharma All Stars were once again at the Long Beach Jazz Festival. This time, they were at City Hall Plaza, and this time, there was a sax player. 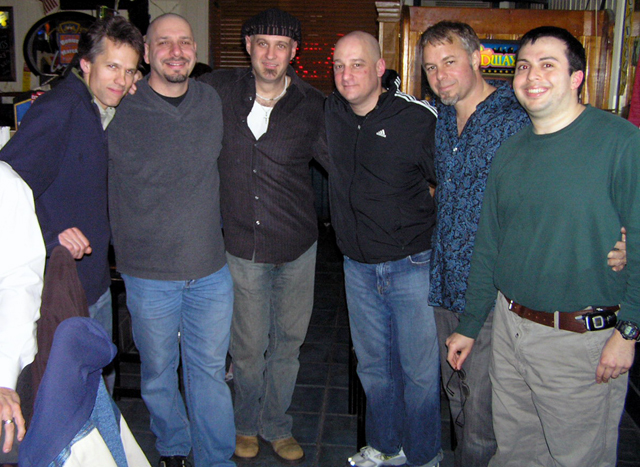 From left to right in a picture taken afterward: Chieli Minucci (guitar), Carl Fischer (trumpet/flugelhorn), Mike Chimeri, John Favicchia (drums), Bill Heller (keyboard), and John Scarpulla (tenor sax). Jack Knight (bass) is not pictured because he had to leave shortly before this picture was taken. It was another great performance. Thanks as always, guys. 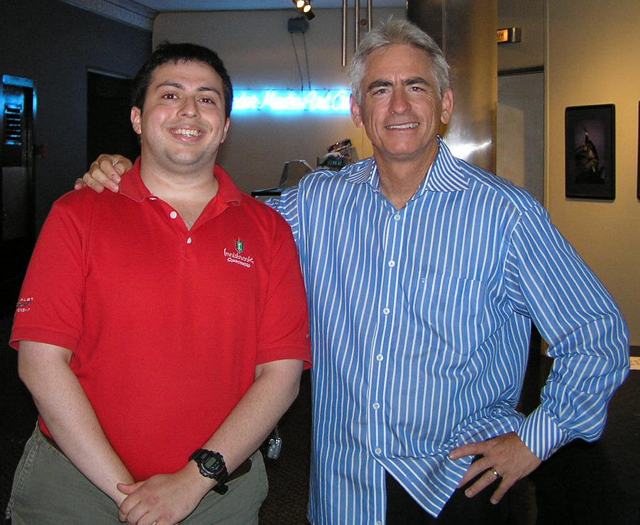 On October 6, 2006, I once again went to IMAC to see Nelson Rangell. 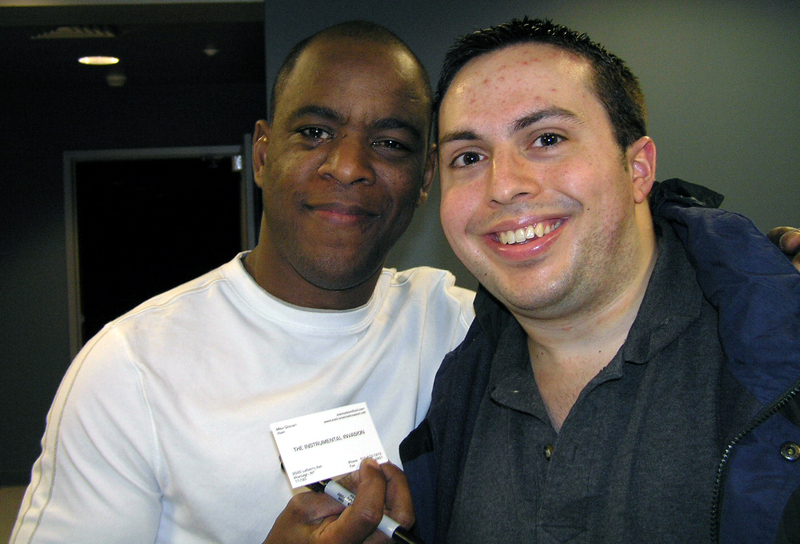 Nelson is pictured on the left, and his long time friend and bandmate Jay Rowe is on the right. (I’m not on fire; it’s just the artwork behind me.) Nelson’s band also featured Dave Livolsi on bass, and Trever Somerville on drums. I was blown away by their performance. When either of them had a solo, they played the heck out of it. And they did the same as a whole. 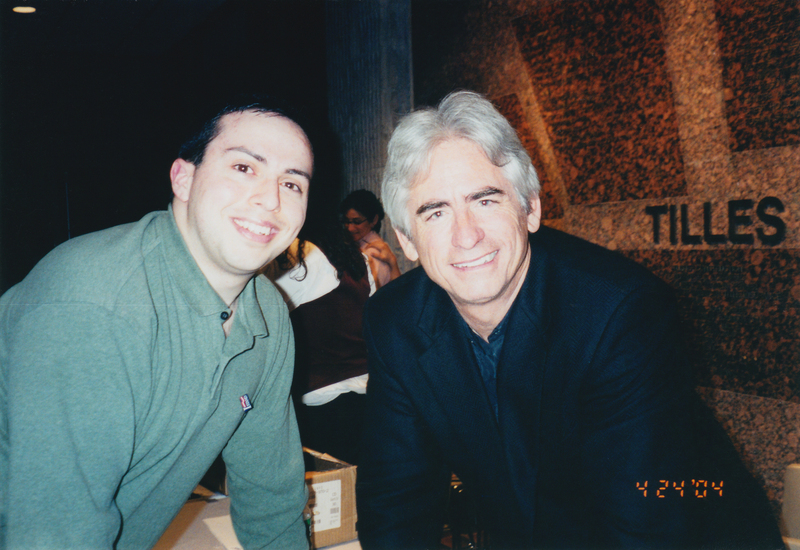 Nelson was actually the first jazz musician I saw in concert when he opened for David Benoit at Planting Fields Arboretum on July 12, 2003. So, to steal David’s most recent album title at the time, seeing Nelson brought me full circle. You’ve seen me pictured with Nelson and Jay, but below, I am pictured with Nelson only. 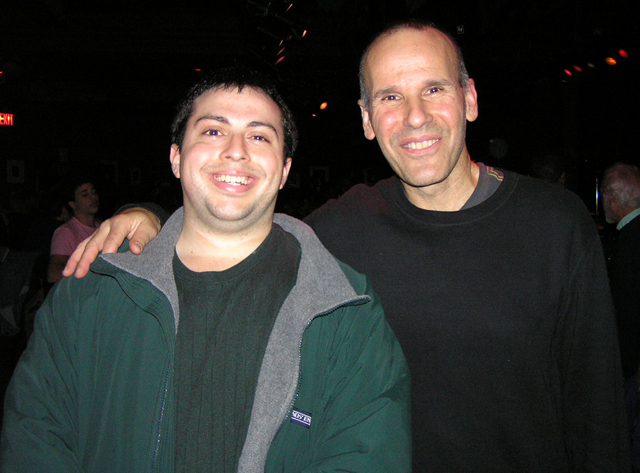 On November 17, 2006, for my 25th birthday, I went to Birdland in Midtown Manhattan to see the band Yellowjackets perform. Like me, in 2006, the band turned 25 (for the record, the band members are older than 25) and commemorated that on their CD/DVD entitled Twenty Five. Russell took), Bob Mintzer on the tenor saxophone and EWI (Electronic Wind Instrument), and Marcus Baylor on drums. At one point, Marcus’ wife Jean came out to sing a song called “The Hope.” Outside of that, the instruments did the singing. Thanks to all of you, and as I told Russell at the end of my interview with him, here’s to another 25! As an interesting side note, Russell and Jimmy appeared on Nelson Rangell’s My American Songbook, Vol. 1 album. 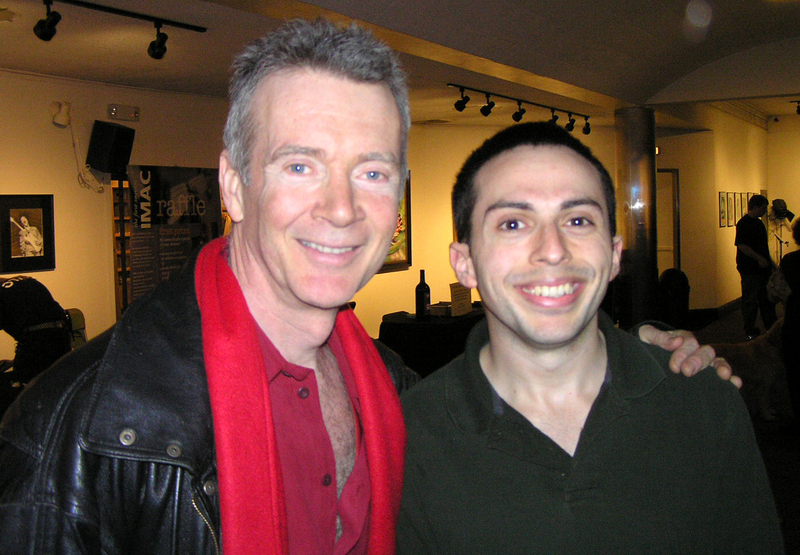 On December 7, 2006, I went to my second straight Peter White Christmas concert at IMAC. I finally met Rick Braun. Nice guy. And, of course, I got to meet Peter White and Mindi Abair again. It was nice to see them, as always. 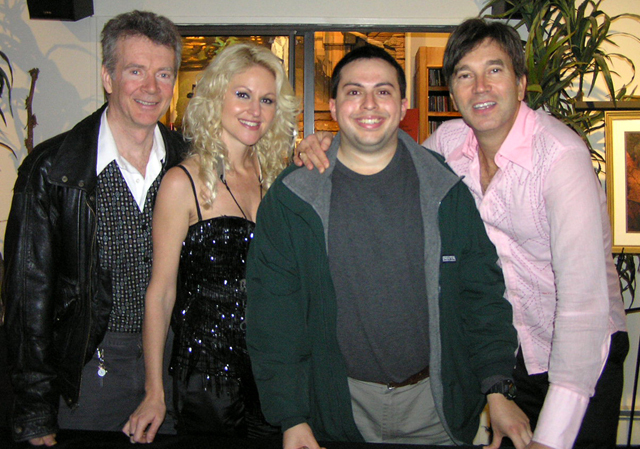 I am pictured below with Mindi, with Rick (I’m half-blinking in that picture), and with Peter, Mindi, and Rick together. On March 1, 2007 (they played on the exact same date in 2006), the Dharma All Stars returned after three months away from D.J. Rider’s (then the Funky Munky Lounge) in Oceanside, New York. I am pictured with Jack Knight (bass), Bill Heller (keyboard), Don Harris (trumpet/flugelhorn), John Favicchia (drums/percussion), and Chieli Minucci (guitar). Not pictured is John Scarpulla (tenor sax). 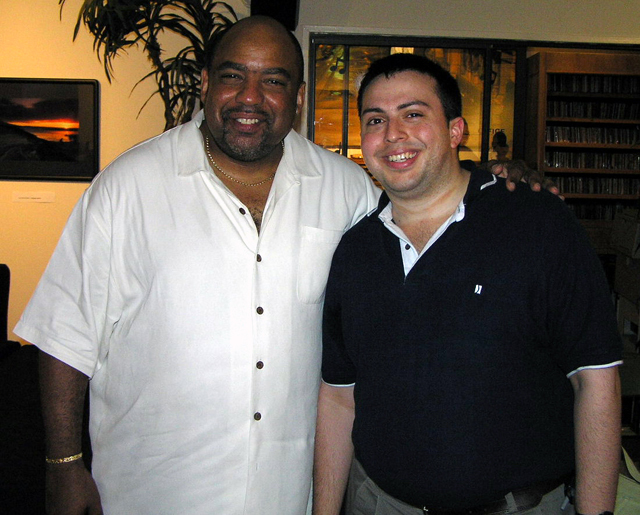 On April 28, 2007, my parents and I traveled to Milford, Connecticut, to attend Jay Rowe’s 5th annual Smooth Jazz for Scholars benefit concert at the Parsons Complex Auditorium. It was quite a night. Jay was on keyboards, Trever Somerville was on drums, Dave Livolsi was on bass, and Steve Scales provided percussion. Ken Navarro, Chieli Minucci, and Rohn (“Ron”) Lawrence were on their respective guitars; Nelson Rangell was on alto and tenor saxophone, flute, piccolo, and he whistled for one song; Marion Meadows was on soprano sax; and Timmy Maia sang a few of the songs. I am pictured above with Ken Navarro and below with Nelson Rangell. The picture with Nelson makes up for the one in October when I was 50 pounds heavier. On May 5, 2007, I returned to IMAC for the first time in five months. I saw Bob James and the Angels of Shanghai, five very talented Chinese classical musicians playing traditional Chinese instruments. “The Devils” – as Bob called them during the concert – were Jack Lee (from Korea) on guitar, Lewis Pragasam (from Kuala Lumpur, Malaysia) on drums, and Al Turner (from Philadelphia; he traveled the least) on bass. 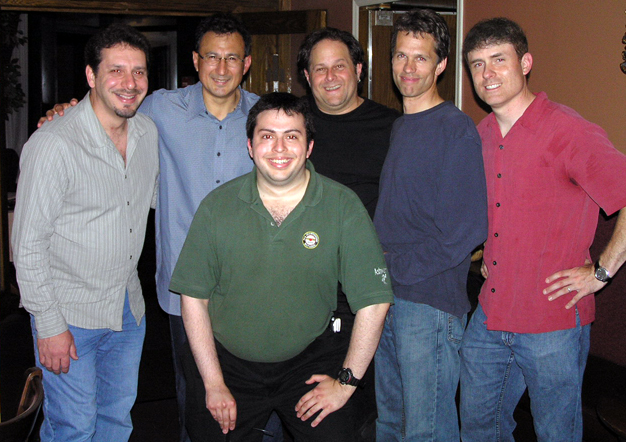 Al has been part of Bob’s regular live band in the past, including May 2006 when they were also at IMAC. That time, Bob and the band did not come out to meet with the fans. This year, they did. 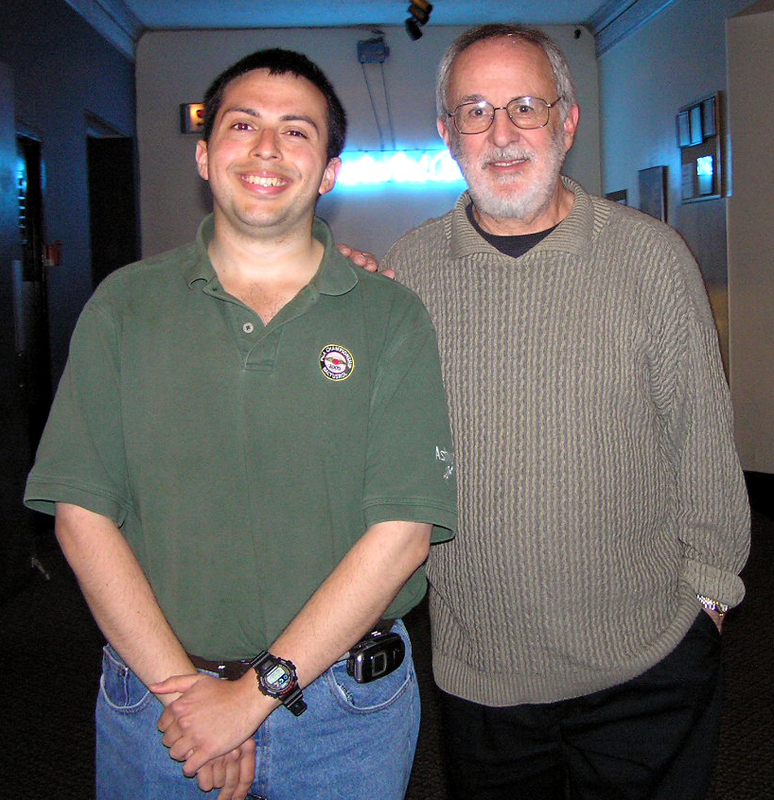 I am pictured above with Bob James. The concert was wonderful. Thank you to everyone, including Marion Orr, Bob’s long-time Production Coordinator and General Manager at Tappan Zee Records. She took this picture shortly after the meet and greet ended. 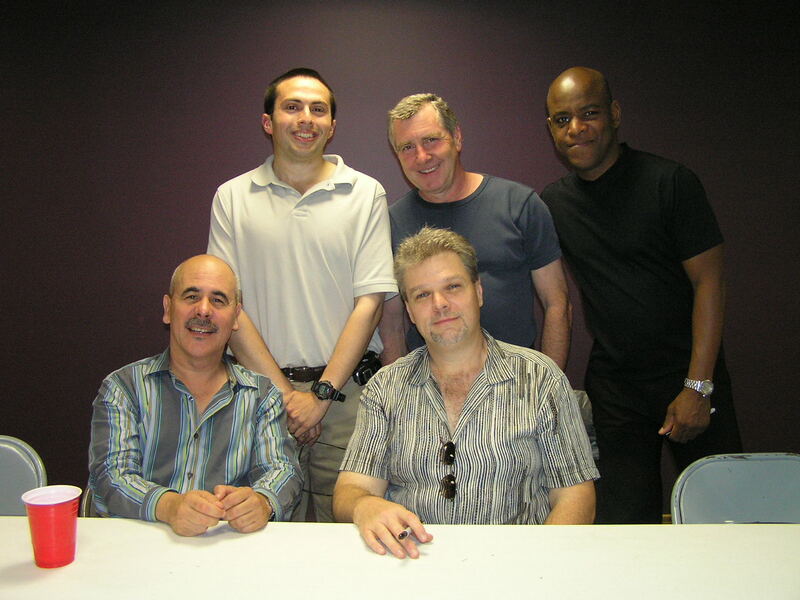 On June 15, 2007, I returned to the Boulton Center in Bay Shore, New York, to see Spyro Gyra. I am pictured with Jay Beckenstein (above left), Scott Ambush (above right), Julio Fernandez (below left), and Tom Schuman (below right). Not pictured was drummer Bonny B., who was a great addition and very exciting. The band as a whole was also exciting and their performance was exceptional…as it always is. Thank you again, Jay, Tom, Julio, Scott, and Bonny. 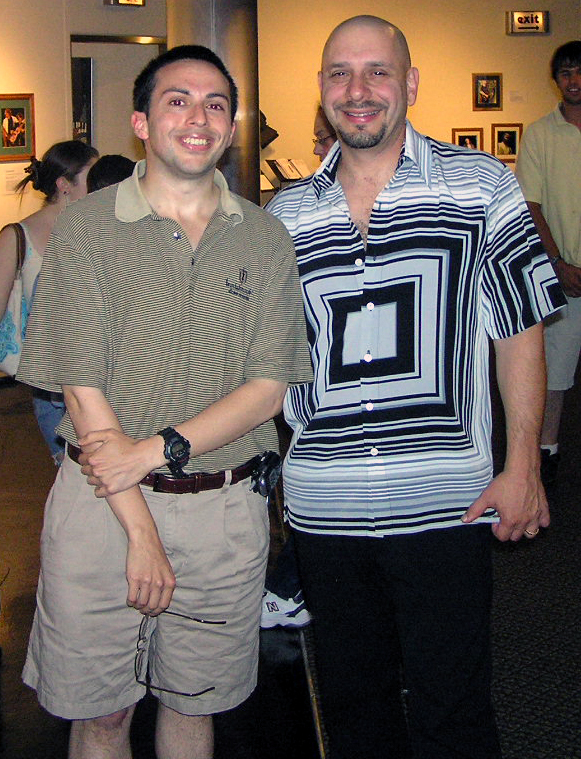 On August 4, 2007, I saw the Rippingtons for the third year in a row at IMAC. Once again, Russ Freeman was on guitars, Kim Stone on bass, Bill Heller on the keyboard, Dave Karasony on drums, and special guest Jeff Kashiwa on saxophone and EWI (electronic wind instrument). I am pictured below with Bill and Jeff. 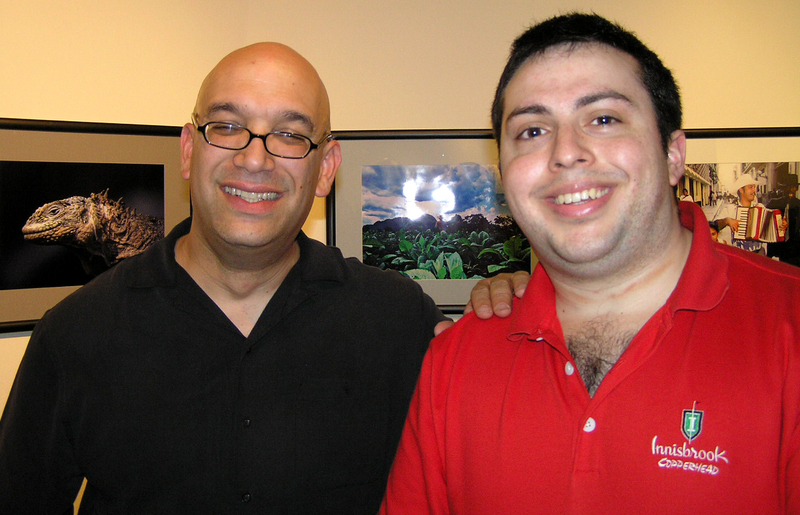 As with Nelson Rangell earlier in this page, my pictures with them make up for the ones where I was much heavier. I am pictured below with Mindi, then Peter, and Rick and Peter. 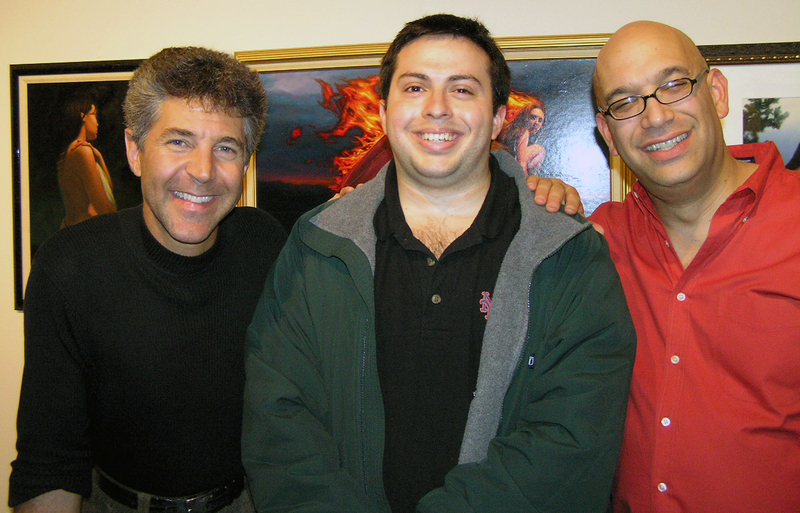 This concludes the “People I’ve Met” journey from the old MikeChimeri.com. I hope to see you at Smooth Jazz for Scholars at the end of the month. I will be at both nights of Smooth Jazz for Scholars, Kathie. I look forward to seeing you there. I think you might have told you how much it meant to you the last time we saw each other at SJFS.